Native American Chicagoans gather in the tipi to play traditional hand and stick games and host storytellers around a fire. 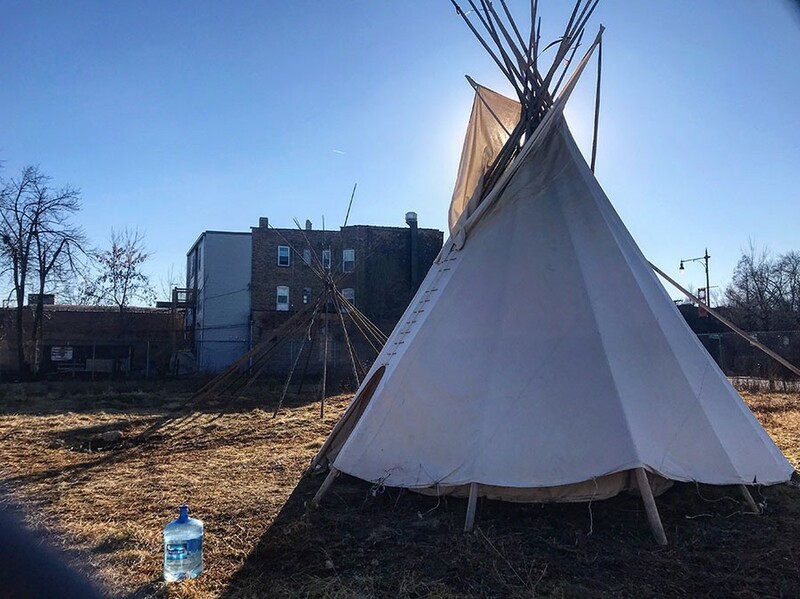 In a formerly vacant lot in Albany Park at the intersection of Pulaski Road and Wilson Avenue stand two tipis—one perhaps 20 feet tall, the other half that height—surrounded by dry, yellowed grass rising up from the cold earth. Across the street to the north is a Citgo gas station, and to the west is the large parking lot of the 17th District Chicago Police Department. The Chi-Nations Youth Council, a grassroots organization that champions environmental and social justice while creating safe spaces for Native American youth, and the American Indian Center, the oldest urban Native American cultural center in the nation, have leased the lot together with the intention of growing a garden. The First Nations Garden will be a space for powwows, environmental education, and traditional ceremonies—and a chance for Chicago‘s land and water ecosystems to heal. “It creates a healing space outside of the chaos of the metropolis that’s known as Chicago today,” said Adrien Pochel, 17, the interim co-president of Chi-Nations. Nineteen-year-old Naomi Harvey-Turner, Chi-Nations’ Sergeant at Arms, said the First Nations Garden gives her a sense of belonging. “It’s not that often that you could practice so many of your traditions and be in that position of your ancestors inside a tipi, and smack-dab in the middle of Chicago,” she said. Since November, Native American Chicagoans have gathered in the larger tipi to socialize, play traditional hand and stick games, and host storytellers around a fire. Chi-Nations was established in 2012 by Native American youth who rejected the conservative leadership of the AIC. Since then, the groups reconciled and leased the lot in November 2018 with the approval of Alderman Carlos Ramirez-Rosa and the City Council. The Chicagoland area is now home to over 50,000 Native Americans from over 140 tribes, according to the AIC. The name Chicago originates from the Miami-Illinois word Shikaakwa (referring to the smell of the plentiful wild onions in the area) and the Algonquin word Zhigaagong. The city was a hub for travel, trade, and hunting long before Europeans arrived on the continent. Before the 1830s, the Potawotami were the primary inhabitants of the area, so Chi-Nations intends to install a wigwam—a traditional dome-shaped dwelling—in the garden, an acknowledgment of the Potawotami’s ancestral homelands and contributions to Chicago as we know it. While the city’s location is ideal for sustaining plant, animal, and human life, it has not escaped the effects of climate change. The Chicago Climate Action Plan (CCAP), a city initiative adopted in 2008, says the city’s native ecosystems are in danger of being irreversibly damaged by rising temperatures. Since 1980, temperatures have increased by 2.6 degrees Fahrenheit. Winters have warmed by 4 degrees. Chicago‘s plant hardiness zone, which indicates the lowest average annual temperature that plants can survive, has already shifted to resemble that of central Illinois in the 1990s—think more sweetgum trees and less maple and birch. According to the USDA Plant Hardiness Zone Map, Chicago is its own island of trapped heat. The rest of Illinois, until as far south as Springfield, is on average 10-15 degrees colder. For the past decade, the city has been working to combat these potentially devastating changes. A 2007 Chicago Climate Task Force report suggested that Chicago reduce its greenhouse gas emissions by 25 percent by 2020 to reach an 80 percent reduction by 2050. Transforming vacant lots into green spaces aids this goal. More green space in the city helps clean the air and manage both floodwaters and heatwaves. Fawn, who is First Nations Oji-Cree, said her understanding of indigenous plants and medicines was passed down to her through generations of family members and is essential to her Anishinaabe culture. For now, the garden space is undeveloped, but Fawn said there are plans to open it to the public on April 13 for a powwow honoring the youth. The process for restoration at the First Nations Garden involves testing the soil and determining the plants that will best detoxify the land. Sunflowers, which have long been a staple crop for many Native American groups, are expected to be featured in the garden. These bright beauties actually break down and eliminate metals and other contaminants from the soil. Even while detoxifying a site, sunflowers can produce seeds that remain safe for animals and humans to consume. Other likely candidates to be planted are echinacea and bergamot, flowers native to the prairies with deep root systems that clean the soil. Also being considered are a giant, ancient breed of squash called Gete-okosomin; strawberries, which are sacred in many Native American cultures; and the four Anishinaabe medicines: cedar, sage, sweetgrass, and tobacco.